"We are seeing an increasing appetite from customers to leverage 3D technology across media, entertainment, retail and marketing to design and deliver fully immersive experiences," said Scott Belsky, chief product officer and executive vice president of Creative Cloud at Adobe, in a statement. "Creative Cloud is the creativity platform for all and Substance products are a natural complement to existing Creative Cloud apps that are used in the creation of immersive content, including Photoshop, Dimension, After Effects, and Project Aero." As part of the deal, Allegorithmic CEO and founder Sebastien Deguy will step in as the leader of Adobe's 3D business, bringing Allegorithmic's 140 employees with him. In a blog post, Deguy described the Adobe acquisition as a dream come true, comparing the moment to Peter Jackson's hiring as director of the Lord of the Rings film trilogy. "Allegorithmic and Adobe share the same passion for bringing inspiring technologies to creators," said Deguy. "We are excited to join the team, bring together the strength of Allegorithmic's industry leading tools with the Creative Cloud platform, and transform the way businesses create powerful, interactive content and experiences." Adobe announced its Project Aero alongside Apple's unveiling of ARKit 2.0 at the Worldwide Developers Conference last year. Currently available via early access request, the company expects the tool to make it easier for creatives to design the same AR experiences that developers are able to through Unity and the Unreal Engine (which also support the Substance suite). In addition, Project Aero also supports the USDZ format behind Apple's AR Quick Look feature for web-based AR experiences. 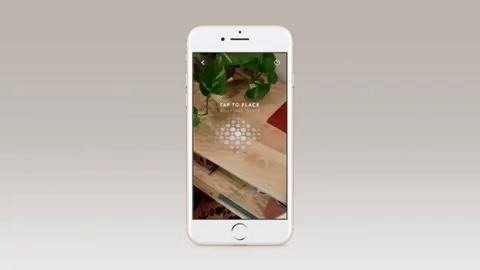 Online retailer Shopify, which was one of the early adopters of the AR Quick Look feature, already uses Substance to texture 3D models for web-based AR experiences. With the introduction of Adobe's Dimension, Project Aero, and the addition of Substance all occurring within the last year, Adobe has quickly become a major player in the 3D content creation space, not only for augmented reality, but also gaming and computer-generated imagery in movies and TV. On the other side of the deal, Allegorithmic brings a customer base that includes Electronic Arts, Ubisoft, BMW, Ikea, Louis Vuitton, and others to Adobe, as well as a portfolio that includes games like Call of Duty and Assassin's Creed and the CGI in movies like Blade Runner 2049 and Tomb Raider. Adobe's aggressive move into the 3D space also broadens the pipeline of augmented reality content by enabling graphic designers, video editors, and other creatives to more easily create AR experiences as the demand from the entertainment and marketing industries continues to grow. "In the near future, we'll live in a world in which real and virtual creations seamlessly blend, a change that will allow companies to create experiences that wouldn't have been possible before, while saving time and money in their production process," said Belsky in a blog post. "And with consumer smartphones and tablets beginning to capture and display 3D content, brands have new opportunities to create and distribute compelling, interactive experiences to delight customers."